This time next week we will be moving and so today I planned an activity for us very unique to Brooklyn. 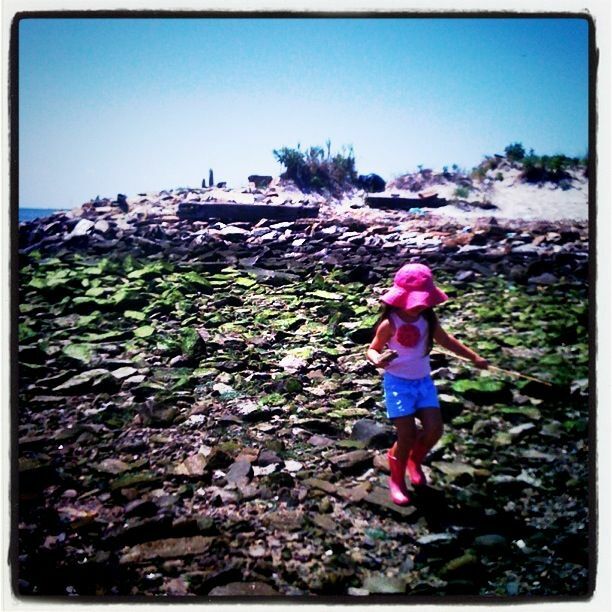 Through our neighbours we heard about Bottle Beach – AKA Dead Horse Bay. They had been to Dead Horse Bay beach combing and had come home with a beautiful selection of antique bottles, beach glass and ceramic fragments. The moment I heard about it, and saw the little glass jars sitting along their kitchen window sill, I just knew I had to go to this intriguing place. As the car industry grew, horse and buggies — thus horse carcasses — became scarce, and by the 1920s, there was only one rendering plant left. 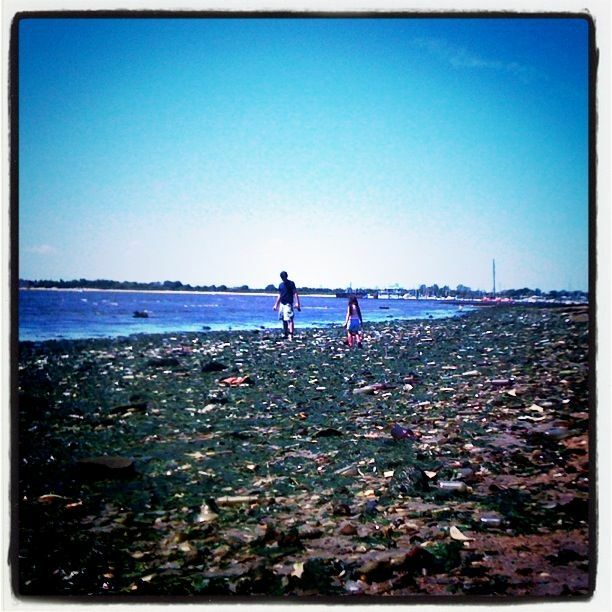 This area used to be called Barren Island when it was a separate island in Jamaica Bay. Barren Island was connected to the mainland of Brooklyn when landfill was used in 1926 to create Floyd Bennett Field New York City’s first airport. Filled with trash by the 1930s, the trash heap was capped, only to have the cap burst in the 1950s and the trash spew forth onto the beach. Since then garbage has been leaking continually onto the beach and into the ocean from Dead Horse Bay – but this isn’t just any rubbish – it is old rubbish and so it holds some antiquity appeal and value. I loved the idea of collecting old New York bottles, and having a little piece of New York history in our home – especially now that we are to have a home of our own and I can begin to collect – which is exactly what we did. All four of us (with a close eye on the Girls for safety) collected bottles. 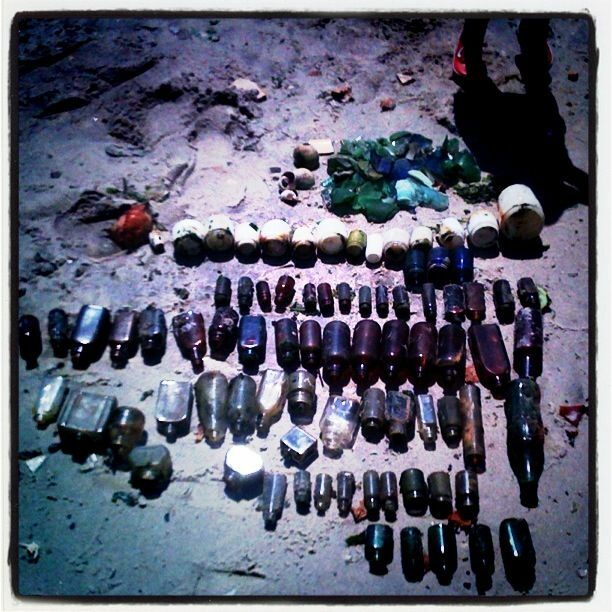 We must have collected about 50 glass bottles and jars – along with a bushel of beach glass. 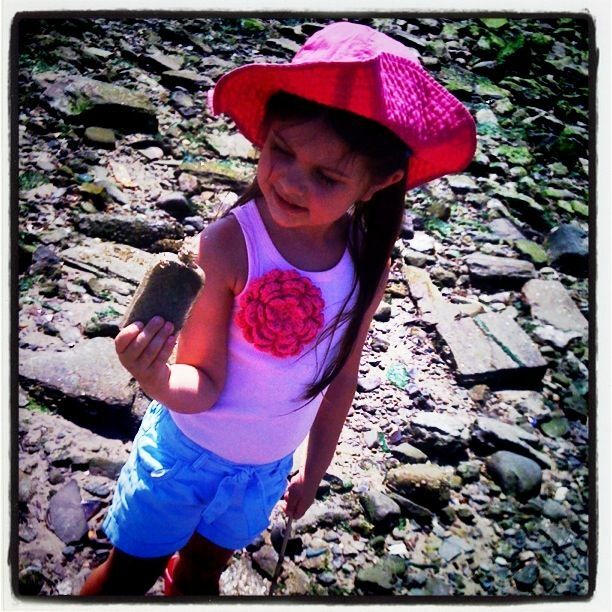 Maya was particularly good at finding them, and seemed to find the best ones. 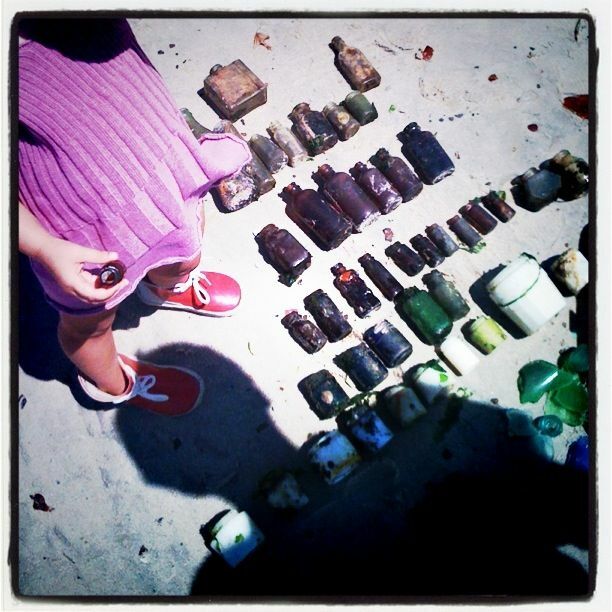 Cam found a coke bottle with New York written on it, and I found lots of Ponds cold cream and old Vicks bottles. Many of which I am not familiar with, and I plan on researching. Our interest did not stop with the bottles, I was enthralled and felt like I was panning for gold. I could not stop searching. I research prior to going the beach exactly how bad it would be – knowing it was not really an ideal picnic spot for the Children. After reading that indeed wildlife still lived there (so it was not deadly toxic) and that if we kept a close eye on them they would be fine. 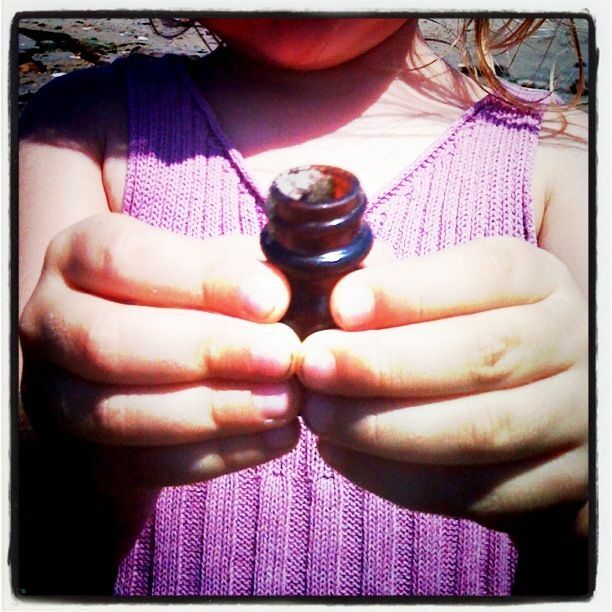 I also packed a first aid kid – including a a squeeze bottle flush (left over from home birth) to clean a glass cut. Thankfully we did not need any first aid – and in fact the only one who wanted to leave was Cam. We saw lots of crabs and sea snails, seaweed, and there were people fishing, so despite the trash, the habitat had life. 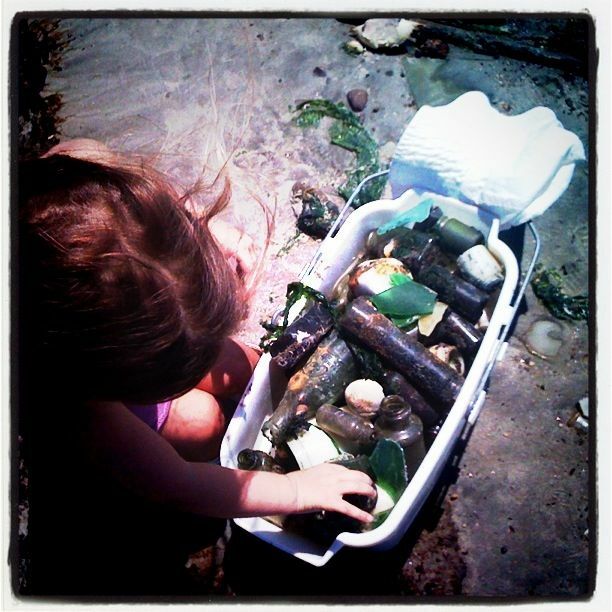 The Girls wanted to stay and keep collecting, it was a giant treasure hunt, and was a lot of fun. 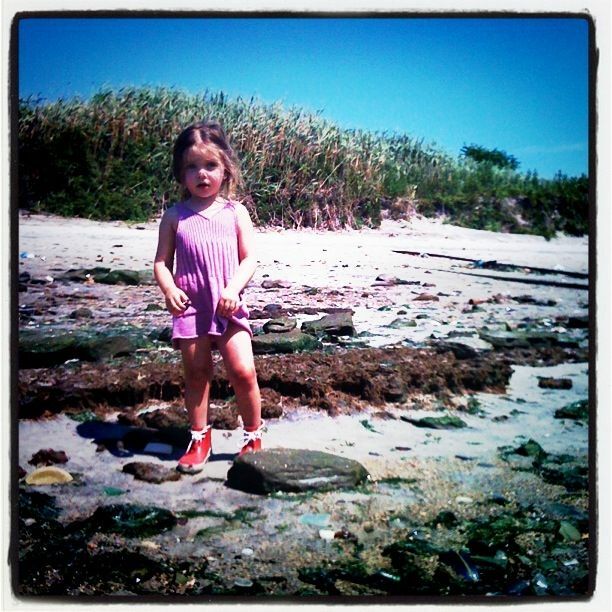 When we got home and were cleaning the bottle, Maya asked “Can we go to Bottle Beach again tomorrow?” Sadly though, our Brooklyn days are numbered, and I still have packing to do! The beach is accessible by walking, or bike, via the Greenway on Flatbush Avenue on the way to Fort Tilden, as you pass Floyd Bennett Field but before reaching the Marine Parkway – Gil Hodges Memorial Bridge. You can leave your car in the Parks & Recreation car lot, and then walk across the road to the walking track. It is a 15 minute walk to the shore through the marshland. I had considered doing this outing on my own, and given the long walk to remote location – I am glad I did not. The best time to go is at low tide, and so I looked up a local tide chart and planned around that. We had a massive beach expanse to comb, and we only traversed a small area of it. I plan on sharing more about Bottle Beach another time – but given I am on August break, will do so with more detailed regular photos later – Yippee – let August Break begin! 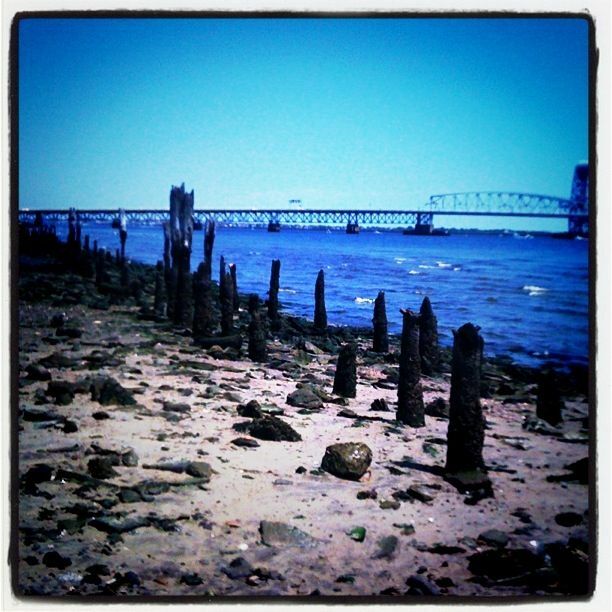 This entry was posted in V I S I T and tagged beach, booklyn. What a fabulous find, I have never heard of this place but what an interesting history and horray for all of the treasures that you found there! I wish that we could have gone with you. They will make a fabulous decoration in our new home!! !